Shown at the September 6, 2018 signing: Front row, left to right: Wolfgang Schoder, CEO of Airbus Helicopters Deutschland; Abdulhakim Gohi, vice president of industrial services, Aramco; Daniel Rosenthal, CEO of Milestone Aviation.Back row, left to right: Alexis Vidal, Airbus Helicopters vice president of sales - oil & gas and leasing; Michael York, Milestone Aviation vice president of Sales - Middle East, Africa, India; Charles Simpson, Airbus Helicopters head of sales - Middle East. 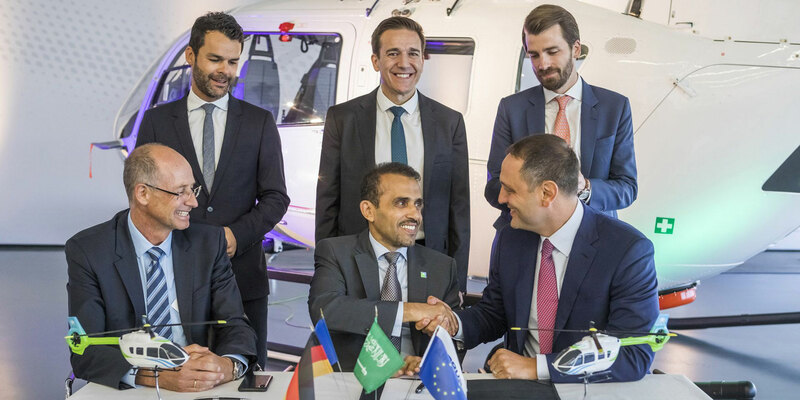 Helicopter leasing company Milestone Aviation Group and Airbus Helicopters will provide five H145s to Aramco Overseas Company, a subsidiary of Saudi Aramco, the companies announced on Monday. The five light-twin helicopters, to be sourced from Milestone’s order book with Airbus, will be in addition to the 24 medium helicopters Milestone currently has contracted on lease to Aramco and are expected to be delivered to Aramco over the next 12 months. More than 200 H145s have been delivered to date and have collectively achieved more than 100,000 flight hours since 2015. The H145 features the Airbus Helicopters’ Helionix avionics suite, two Fadec-equipped Safran Arriel 2E engines, and seating for up to nine passengers in utility configuration. “We take pride in the fact that our long-term partnership approach to further assist Aramco with the introduction into service of their comprehensive medium and light-twin fleet renewal program now places Aramco as one of Milestone’s largest global customers,” said Milestone CEO Daniel Rosenthal. Earlier this summer, Milestone and Saudi Aramco signed a deal for up to 21 Leonardo AW139s to be delivered over the next three years.